Snow! I’m a Southern girl, for sure, and I always am so elated when it snows! Mother Nature graced us with several beautiful inches of snow throughout the day Tuesday. The federal government called for a snow day, and boy was it glorious! There wasn’t a speck of snow when I woke up that morning, but we soon were getting about an inch an hour for much of the day. It was such a peaceful, beautiful fluffy snow – so magical! I thoroughly enjoyed my four day weekend and spent the day watching movies, baking banana nut bread, working on some fun projects, and reading. It was a nice snow to go for a walk in, too – I love the above picture from my snow-covered street! Wahoo! 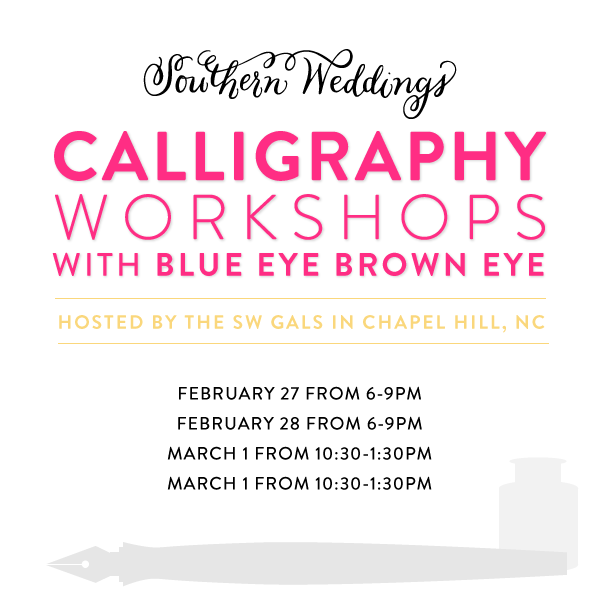 It was such serendipitous timing that I was home for a snow day on Tuesday and saw the Southern Weddings post go up about their calligraphy workshop in Chapel Hill with the oh-so-talented calligrapher Lauren from Blue Eye Brown Eye! Ah!! I seriously squealed out loud when I saw this – God’s perfect timing, for sure! Of course, one of my goals for 2014 is to learn calligraphy, so I’ve been looking for the right opportunity for a while now. I had been on the fence about another DC-based calligraphy workshop, but it was a bit pricey so I was really unsure. However, this opportunity is so, so perfect and I am ecstatic. It’s also my birthday weekend, so… happy birthday to me! 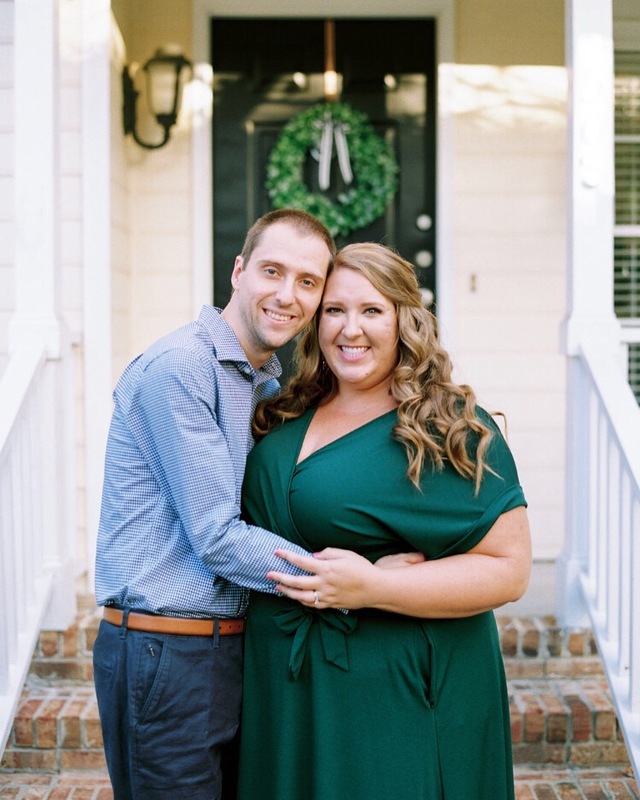 Road trip to Chapel Hill to learn calligraphy with Southern Weddings + Lauren? Can’t wait. Last weekend, some friends and I ventured to the Winery at Bull Run for an afternoon filled with good wine, chatting, and relaxation. I love how plentiful wineries are around Virginia, as wine tastings and afternoons at wineries are one of my favorite things to do. There’s always such interesting history – this winery is adjacent to the Battle at Bull Run/Manassas during the Civil War. Sometime you can hear cannons being shot off when re-enactments are going on, even! It’s such a picturesque winery with great wines (the Meritage is my favorite) and ample indoor seating during wintertime (and fabulous outdoor seating – and rocking chairs! – for when it’s warm out)! Harder than it sounds – but so very, very necessary! Linking up with 5 on Friday! YAY! Can’t wait to meet you!! Thank you!! I’m so excited – what a great collaboration y’all are doing! It will be so good to back in Chapel Hill, too – I’ve missed it! Ah Calligraphy is perfect for you! Your hand writing is already amazing to me. 🙂 Can’t wait to see the pretty things you make! Thanks, Trisha! I’ve been practicing very, very rudimentary calligraphy for a little while, but it’s such an art. I have so much to learn, and I can’t wait to! Lots of love to you! OMG wait what?! Calligraphy in Chapel Hill?! That’s my home town! I’m totally going to look this up – I would love to learn calligraphy! The snow looks so beautiful, I hope we get some soon here in Charlotte! Have a great weekend! Yes! A calligraphy workshop in Chapel Hill in March through Southern Weddings. And it looks like we have lots in common – Charlotte is my hometown, but I went to school in Chapel Hill! Love NC!! I’ll be attending the calligraphy workshop on Saturday afternoon, is that the one you’re attending? I’m super excited already! Hi Laura – yes, I’m going to the one Saturday afternoon!! I am so, so excited, and I can’t wait to meet you, too! Thanks for reaching out beforehand!